Presenting Chiang Mai Volunteer Group #256! This was a group that arrived in mid-February, 2019 – so a little slow to post. A great group of nine volunteers and interns from the USA, Denmark, Canada, and Lebanon. 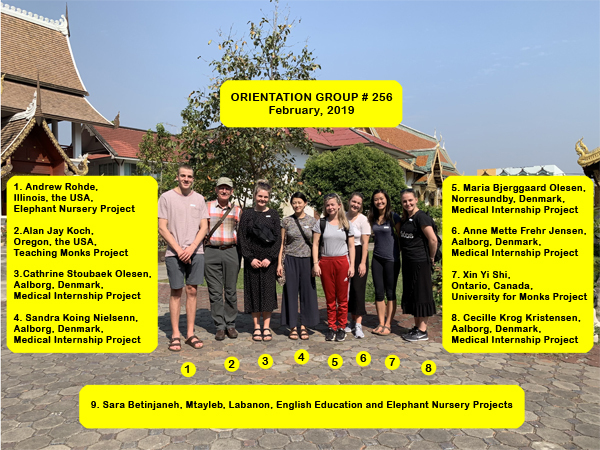 They participated in our Elephant Nursery, Teaching Monks, Medical Intern, University for Monks, and English Education Volunteer Projects! We still have availability in our programs for most of our busy upcoming summer dates. Please visit our Projects Page. "Friends For Asia has definitely made my trip marvelous and unforgettable. Living in Chiang Mai for 2 weeks as a volunteer, I had the precious opportunity to experience Thai life almost as a local. People here always wear a big warm smile, and the city would just melt everyone’s heart. I would highly recommend volunteers to come teaching English to Monks. The satisfactory feeling that comes afterwards is truly rewarding!"